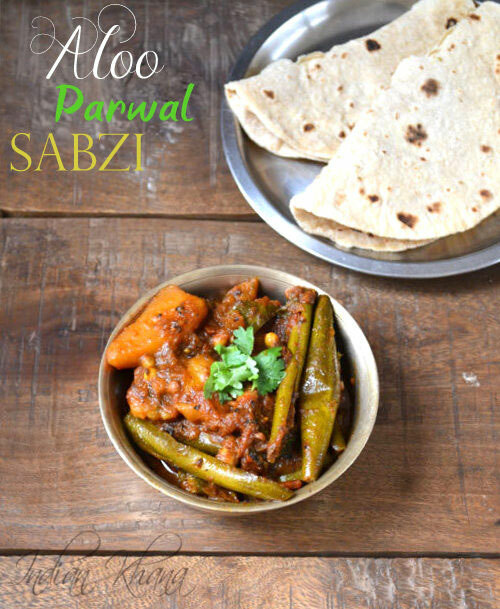 There was a time I never use to like Parwal (parval) aloo or patal sabzi as we call it but now I like to eat Parwal Aloo perhaps due to the fact that we don't get parwal or pointed gourd here in Singapore and if we some times find it then it's not fresh so I never buy parwal here. Since parwal is seasonal vegetable it's difficult for me to eat I have to in India that particular season which happened this time. I had a short India trip and now that Parwal is in season I made it at my in-laws place in authentic U.P style. At my in-law place parval is not a very popular veggie and they make it in a quite different way so when I started to make my version everyone was skeptical. 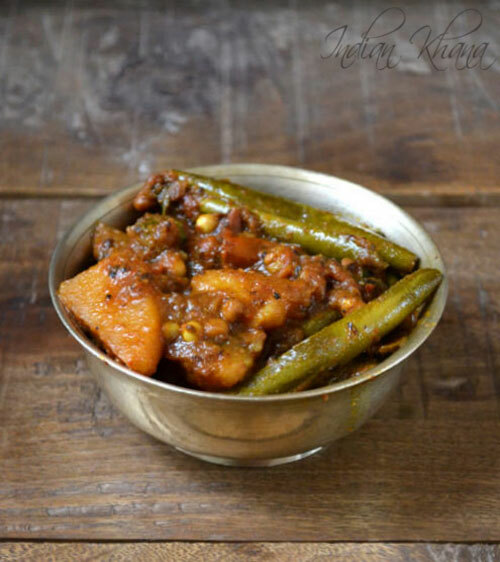 But I have full faith on my parwal aloo sabji this is one of the sabji that I make really well and whenever I prepare this I get only praises. It's a simple recipe but the main part is frying the parwal well, it's time consuming but it's worth it. If you don't fry the parwal well then the curry won't taste as good it suppose to be so keep patience and saute it well. If you wish you can skip the whole garam masala that is listed to grind with onion we do it this way but some people might find it too much of masala. The dark brown color is achieved from sauteing veggie and onion paste well if any of the step not done properly then you may not get the result as you see here. 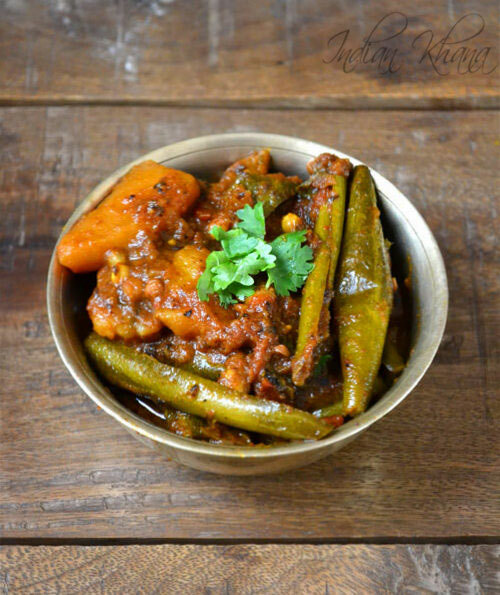 This curry goes perfectly with roti, paratha or poori or with rice and plain/tadka dal. I took these pictures in hurry as every one was waiting for me to start lunch and added only few step by step pictures as both my camera and phone battery ran out...perhaps next time I can update the pictures until then enjoy the Aloo Parwal. 1. Rinse well, peel and slice potato, cut both ends of parwal and slice each parwal in 4 pieces. 2. In a kadai (wok) heat 2 tbsp oil add parval and fry it with stirring regularly until it shrinks to half it will take 5-8 minutes in high to medium heat. Now add potato and keep frying (add more oil if required). 3. Fry until potato gets 3/4 cooked and parwal gets shrink fully another 8-10 minutes. Remove from kadai and keep aside. ~ If you don't fry parwal well then the curry won't taste as good it suppose to be, this is the most important and time consuming step but do it. The round balls are parwal seeds which we can eat. 4. While we fry the parwal and aloo, peel and roughly chop onion, grind together with rest of ingredients mention under 'To Grind Together' without water, chop tomatoes. 5. In a same kadai (wok) remaining heat oil, add bay leaf, hing and saute for 30 secs. Add onion paste and keep stirring until it start to leave oil and no more of raw smell. 6. Add chili, tumeric and coriander seeds powder and mix well, now add chopped tomatoes stir and cover, cook for 3-5 minutes in medium heat or until tomato gets mashed, do stir in intervals. 7. Add water, salt and bring it to good boil. Add fried parwal & potato stir, cover and cook for 12-15 minutes in slow to medium flame or until potato is fully cooked and gravy becomes thick. 8. Add garam masala, chopped coriander leaves mix well and off flame. 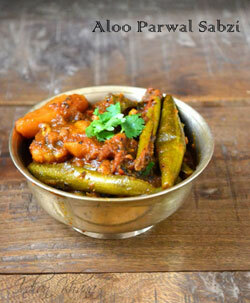 Serve hot with roti/paratha or chawal-dal. Skip or reduced whole garam masala if you don't get too much of spices. What you see in step wise pictures that kadai is way too huge (which doesn't looks in picture as I took close up pictures) and there's lot of parwal plus potato which served around 14-15 people. I mentioned the ingredients in small quantity, you can adjust quantity according to your needs. As I mentioned multiple times fry parwal well it should be shrink like you see in the pictures. You can peel parwal if you like in my parents house we don't do that. Round balls you see in the curry are parwal seeds which are edible, it's actually quite crunchy. We use oil on a generous side as we have to fry parwal and potato, since we make this once in a while it should be okie I guess ;) or you don't get real good results. Other authentic Uttar Pradesh recipes you can check here.